Before thinking about any kind of promotions, the first step is to analyse your sell-through rate. 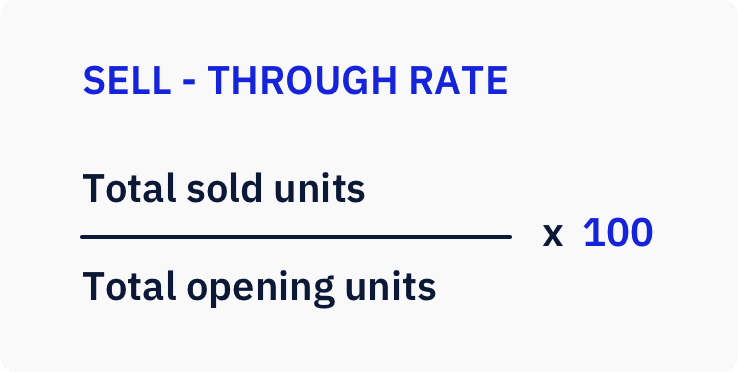 A sell-through rate is obtained by dividing the number of sold units over the total opening units within a data set. For example, if Jeans A has an opening stock of 50 units and sold 25 units, then Jeans A would have a sell-through rate of 50%. The example above shows the performance of multiple colour options for blouse A from retailer X’s Spring collection. From the sell-through rates, we can observe that blue and purple for Blouse A fell under the average sell-through rate of 42%, while pink and yellow performed significantly better. This could stem from the consumers’ shift in colour preference by the season. Therefore, we can concur that the yellow and pink options for blouse A were the bestsellers, while blue and purple were the slow-movers. The sell-through rates of your assortment should be then measured and documented to determine the slow-movers. Once you have determined the sell-through rates for your products, benchmark it against the average sell-through rates of its respective categories. While certain percentages may not necessarily meet the intended sell-through rates, prior actions can be taken immediately to avoid an accumulation of dead stock.